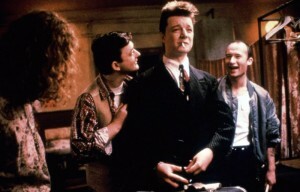 Dublin is awash with people that have no talent but for band manager and local nice guy Jimmy Rabbite (Robert Arkins), he wants to find those with some. He will audition anyone who will do it. This leads him to find 10 unlikely people to put together to form a soul band. These 10 are some of the most talented but also the least experienced in the profession. Now Jimmy will take them from the grim, unlit lights of the streets to the bright lights of fame, success and money. Well that is the plan at least. This film is a please all type of deal. 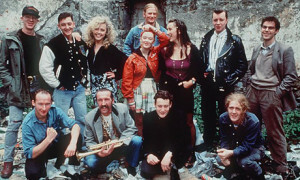 My point in the way I say this is that people see films like the Commitments and come away happy and fulfilled. It tells a story that is rags to riches, failure to success and hope to dreams. No mean feat in itself but Parker gives us much more than that in so much as he makes the film still grotty and real enough to make us care. He also adds the political and social commentary that has substance and subtext. The music is a joy, the performances are dynamic and funny. Overall the film is a pleasant walk inside a world less travelled but uplifting in mind and spirit. The DVD has been given to us with the documentary 25 years later that I personally feel added nothing to the overall film. By this I mean that much has been said about this film but people aren’t adding new words just revisiting. Said before and last time with feeling. Finally the commentary is guarded and I felt lacked anything like the conviction the film had.